Ever since I was a kid, I have been fascinated by World War Two. Many a day was spent in the Townley Branch of the Union Public library, sitting on the floor while reading a whole book, then check a stack out to bring home. My favorite subject became ships and naval battles, especially the US Navy and the war in the Pacific. Of all the famous ships that fought there, none captured my imagination more the CV-5, the original U.S.S. Yorktown. One of the first books that made an indelible imprint in my mind was a book about the Battle of Midway. Before I read Walter Lord’s Incredible Victory or Gordon Prange’s Miracle at Midway (still my favorite account of this battle), I read this book about Midway that for the life of me I can’t remember the name of! I do remember first page of every chapter had a silhouette of either a Japanese or American plane that participated in that engagement. In many books, there is something that captures your imagination. In Tora, Tora, Tora, it was the passage describing Nevada’s run for the sea. In this book on Midway, it was the Chapter titled “The Dive Bombers Score.” After reading this book, I was hooked on the Battle of Midway, and on the gallant Yorktown herself. I remember reading about the Yorktown’s sinking, and getting mad, for it seemed as though she was going to be saved. In retrospect, had Captain Buckmaster NOT abandoned ship and tried to salvage her that first night, perhaps she would have survived…but perhaps not. 60 years later, it’s easy to second guess the commander on scene, who’s ship seemed ready to capsize at any moment. So, being a fan of the Yorktown (but not a big enough fan to sink $700 in the Blue Water Navy kit! ), you can imagine my pleasure at finding this book at Barnes and Noble a few years back. I finally had a chance to pick it up and read it this year. If you are a fan of this period of history and theater of operations, you’ll love this book. The first chapter opens with the dive-bombing attack that left the Yorktown dead in the water, and the Japanese thinking they had sunk one U.S. carrier. The books switches gears in Chapter two, becoming a chronological history of the carrier and more importantly, the stories of the men who served on her. We learn about sailors such as Pete Montavalo, John Underwood, James Liner and the famous Jimmy Thatch. Nesmith does a good job of interweaving their stories with that of the ship, from Pre-war days to Pearl Harbor and onto Midway. December 7, 1941 found the Yorktown in Norfolk, ready to undergo a major refit. That refit was hurriedly canceled, and the carrier and crew headed through the Panama Canal to the Pacific. After joining the Pacific fleet, Yorktown participate on raids on the Marshalls and Gilberts. There an interesting side story about a few pilots who landed their plans on Guadalcanal long before that island became a household name, and were able to get back to Australia on a sailboat lent to them from Plantation owners in the Solomon islands. The spring of ’42 found Yorktown in the company of the Lady Lex in the Coral Sea, where they engaged in the first carrier vs. carrier battle. The outcome was mixed…the Japanese were thwarted from their invasion plans of Port Moresby and lost a light carrier, but the Americans lost Lexington, and Yorktown was badly damaged. Needing three months in the yard, the Yorktown got about three days, and then was off to intercept the Japanese fleet off Midway, tying back into the story began in Chapter One. 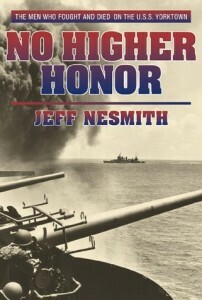 It is during the Battle of Midway that Nesmith is at his best, putting us with the characters we’ve become involved with along the way, as they try fight their carrier through the Japanese attacks on the Yorktown, which is now much more that just a ship, but has become their home.